My name is Millie. I originally come from China but I go to Hammond School in Columbia, South Carolina, as an international student. I am on both the school and the state math team and take great pleasure in solving math (especially geometry) problems. I also love horseback riding; I have been riding since I was nine years old and am currently on the school's equestrian team. This Demonstration shows how one inherits specific traits from his or her parents. Some traits follow a dominant pattern of inheritance while others follow a recessive one; while it is not specified in the Demonstration which pattern each trait follows, the goal is for the user to explore the way genetics work. The user can decide if the alleles are dominant or recessive in order to yield specific physical traits of the baby as well as determine if certain genes are mutated in order to pass down genetic disorders to the baby. 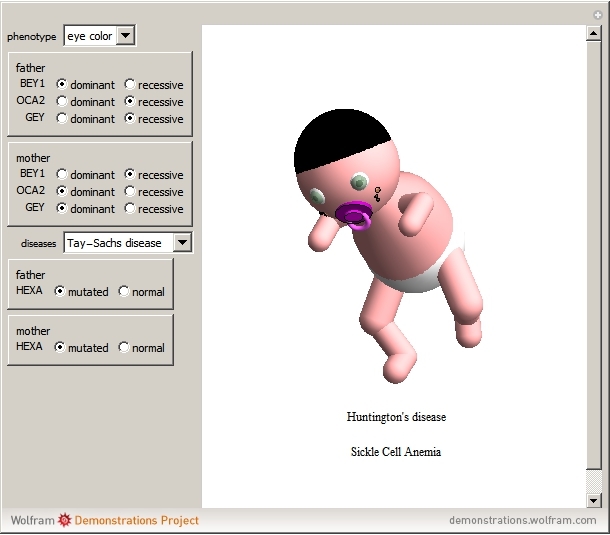 Therefore, the Demonstration can be used as a tool in understanding genetics.